Managed by the EU Publications Office, EUR-Lex is the result of merging the EUR-Lex website with the CELEX database on European law. It provides direct free access to European Union law, treaties, legislation, case-law and legislative proposals. Along with extensive search facilities (including a very advanced option), EUR-Lex features a great amount of integrated data and structured information ranging from the full text of dossiers to newsletters and other official documents retrievable in such formats as html, pdf, tiff. Despite its large size, the whole content is well-organized and fairly divided in several sections and collections. Direct access to the Official Journal of the European Union is also possible with its online editions in pdf format from 1998, while texts prior to this date must be searched in the archives. Completely free and open to the public, this website also features a good series of link pointing to other EU institutions, repositories and resources and its content is regularly updated. Starting from the main page, the website interface is then available in 23 languages, while also the vast majority of documents is available in all EU languages that are/were official on the date of adoption of the document. Under a very professional outline and structure, EUR-Lex offers also several useful options for a successful navigation. The Official Journal of the EU is the most important source for feeding EUR-Lex with documents. One major characterisitc of this publication is its availability in all 22 – and i.a. for acts adopted by co-decision: 23 – official languages. 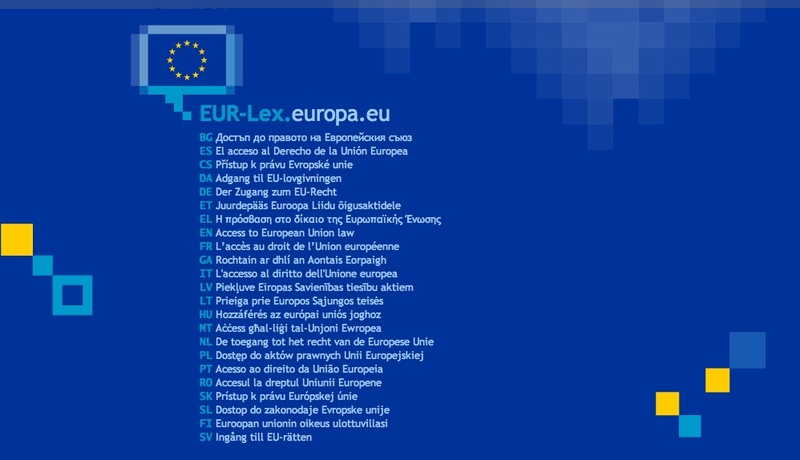 As a result the vast majority of documents is available in EUR-Lex in all languages that are/were official on the date of adoption of the document.